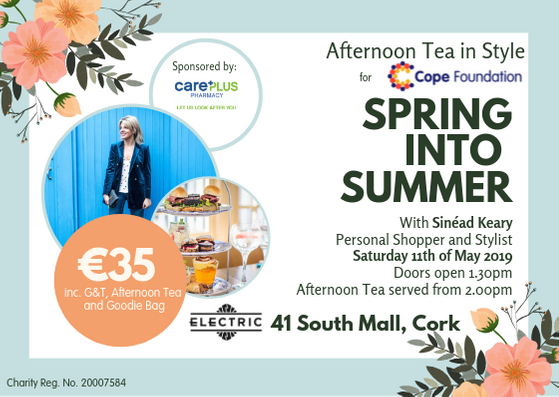 Join us at Electric on Saturday 11th of May for one of Cork’s most stylish afternoon tea events in aid of Cope Foundation. Tickets €35 (plus online booking fee). Our Spring Into Summer Afternoon Tea is an opportunity for ladies to get together and indulge in some delicious afternoon tea treats as well as a complimentary gin and tonic. Our guests will also get to enjoy a showcase from Personal Shopper and Stylist Sinead Keary who will guide you through the essentials to bring your wardrobe from Spring into Summer. Make sure you dress to impress as Sinead will be judging the ‘Best Spring Into Summer Outfit’ with a wonderful prize for the taking. You can buy tickets online here or through the Communications and Fundraising office on 021-4643323. Thanks to our overall event sponsor, CarePlus Pharmacy.